Christmastown, Vermont: where it's Christmas 365 days a year? To Darcy Carr the holiday is depressing enough without reliving it every day. Her thriving wreath business and faithful cat are no longer enough to distract her from the pain of her past memories or her current loneliness. Is her frosty neighbor, the only man in town with no Christmas decorations, just another Scrooge, or could he be the one she's been looking for? Coppersmith Dean Whitfield hasn't celebrated Christmasor anything elsesince the death of his wife and unborn child. And he certainly has no desire to carry on the family tradition of crafting a star for the town's Christmas tree, even if it will benefit a charity. 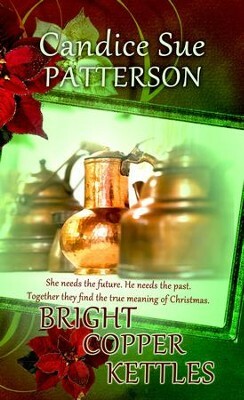 Can Darcy and the joy of the season thaw his frozen heart and help him love again? Tell us a little about yourself. Candice Sue Patterson studied at The Institute of Childrens Literature and is an active member of American Christian Fiction Writers. She lives in southern Indiana with her husband and three sons in a restored farmhouse overtaken by books. When shes not tending to her chickens, splitting wood or baking bread, shes at her computer working on a new story. Candice writes contemporary romance with threads of nostalgia set on the east coast. What do you hope folks will gain from this project? I want readers to remember that God is good to His children in the good times and the bad. Though at times it may be hard for us to understand His plan, and it may feel like He's not there, He is. Even when it's hard to pray, we need to keep the door of communication open with Him, so He can speak to us. If we close that door, our emotions could get the better of us and cause us to be bitter and angry toward God, making us unusable vessels for Him.